Srinivas Bhogle and Purnendu Maji identify Rediff.com's Most Valuable Players in IPL 11, after Week 4. It was Andre Russell after Week 1, Shane Watson after Week 2, and A B de Villiers after Week 3. 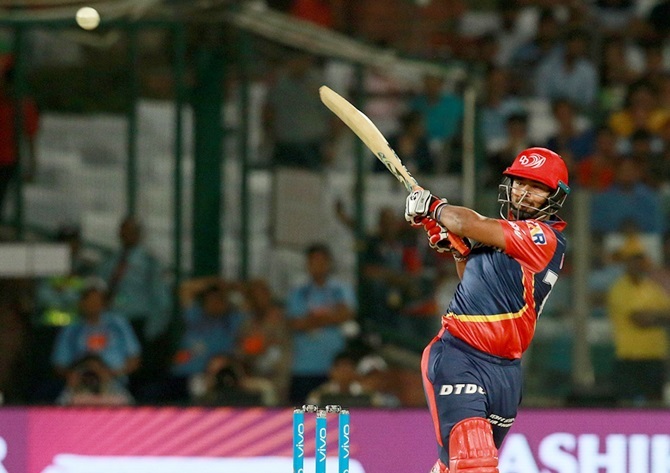 Week 4, the MVP in IPL 11 is Rishabh Pant. He's up there because he has scored 375 runs at a blazing strike rate of 180. And being a wicket-keeper, he also earned more points for catches and stumpings. The Most Valuable Player Index (MVPI) collapses a player's batting, bowling and fielding performance into a single 'run equivalent'. All the prolific batsmen are up there: Shane Watson (Rank 2, MVPI 460), Ambati Rayadu (4, 447), K L Rahul (6, 384) and Virat Kohli (8, 378). It is a special joy to see the amazing warrior Mahendra Singh Dhoni (3, 451) up there after a few less productive IPL years. And all-rounders -- with two avenues to contribute -- are often a fixture in the top 10. There's Sunil Narine (5, 412) and there's Krunal Pandya (8, 375) after the amazing ease with which he took the Mumbai Indians to victory on Friday night. The MVPI table contains an incredible amount of information, and offers a lot of insight if you have some curiosity and patience. For instance, how are foreigners faring this year? Australia in the top 50: Shane Watson ( Rank 3), Chris Lynn (23), Glen Maxwell (28 ). Andrew Tye (41). Remember: no Warner, no Smith. England in the top 50: Jos Buttler (22). Ben Stokes with an MVPI of 139 is outside the top 50. New Zealand in the top 50: Kane Williamson (12), Tent Boult (38), Mitchell McClenaghan (50). We mustn't forget Shakib Al Hasan (18) from Bangladesh and Arshad Khan (32) and Mujibur ur Rehman (36) from Afghanistan. The IPL has learned to live without players from Pakistan, but where are the Sri Lankans? All data in our analysis is updated after the 34th game on May 4, 2018.